If you ever want to clear your sinuses, eat a teaspoon of this stuff! 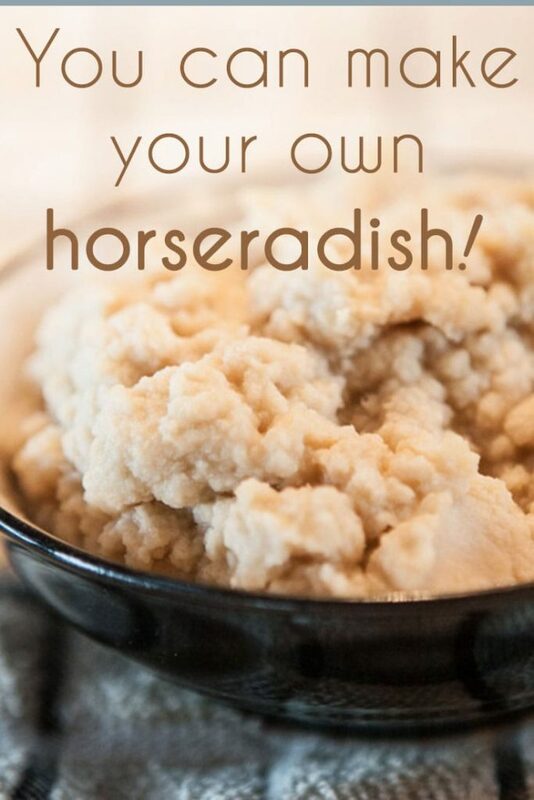 My mom loved horseradish and would dip in an occasional spoon, eat it straight and roll her eyes back in pleasure. 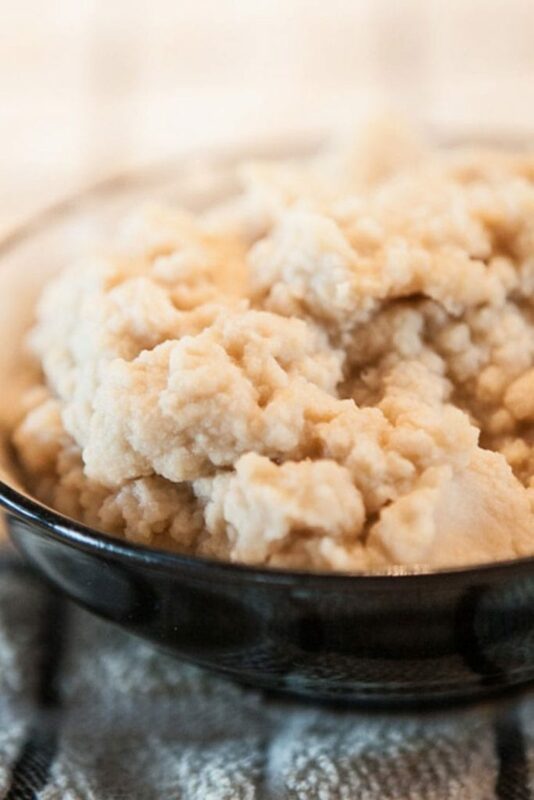 Normally horseradish is not fermented, but rather quickly mixed with vinegar to help stabilize and preserve it. I decided to ferment it as an alternative preservation process and it seems to have worked quite well. 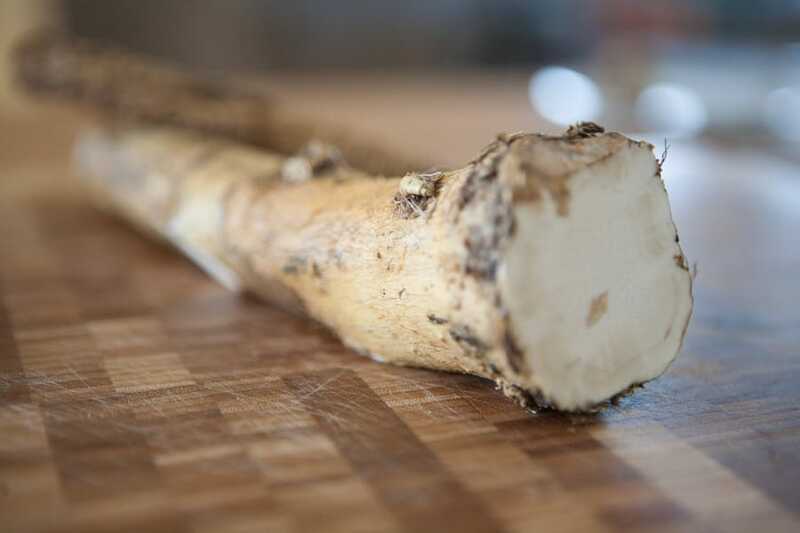 I had seen some fresh horseradish root at Corners of the Mouth, a great little cooperative grocery in Mendocino where I like to buy most of my fermentables, and picked some up. It sat in my fridge for awhile but I finally got around to fermenting it and am glad I did. Having a good blender (I used a vitamix) or food processor is imperative as you’ll need to puree this. While pureeing it, I had to go outside a few times as the blending process releases the inherent mustard oil which can be irritating to your eyes and sinuses (think chopping onions x 3). Place the cubes into a good quality blender (which has a tamper) or food processor with 1 cup of the water, the sea salt and sugar. Blend until creamy smooth. You’ll need to use a tamper on your vitamix to keep it blending as the mixture will remain fairly thick. Continue to add additional water as necessary. Mine took a total of 1 1/2 cups of water but yours will vary depending on the moisture content of your horseradish root. Place the pureed mixture into a widemouth jar or small bowl. To help protect the surface from mold since it directly touches the air, mix a topping brine with 1/2t salt and 1/2c water. Once dissolved, pour gently on the horseradish mixture so that this salty liquid remains on the surface. Over time this may absorb into the surface ingredients. Don’t mix it in until fermentation process is complete. Cover with a cloth and let it sit for 3 weeks. 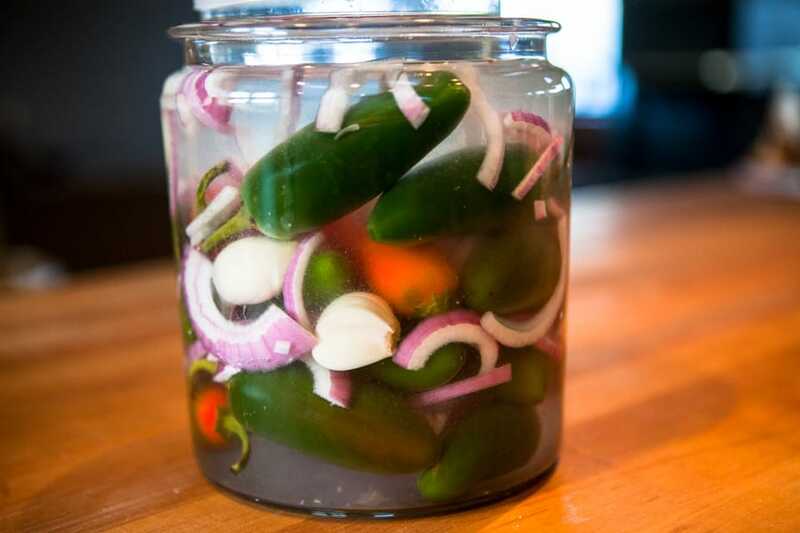 Jar it up and place in a refrigerator. In my opinion, the flavor after this fermentation period is much more subtle and enjoyable. I haven’t come up with too many uses for this yet, mostly mixing it into dressings and channeling my mother now and again. You can also mix this into soy/tamari as an alternative to the more expensive wasabi when eating sushi. I find it dissolves into the soy/tamari much more easily than wasabi powder or the paste you can buy in stores. Next up on my fermented condiments calendar – fermented mustard! Great idea! 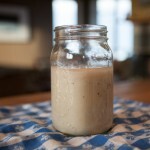 Have you tried to add it to other ferments, ones that you want to eat fresher? I made a very strong horseradish sauerkraut, fresh it was too intense, but after about six weeks in my fridge turned sublime. Reading your recipe I thought it might be a great way to get the age mellowed taste but having a younger ferment for the rest of the recipe. Hi Ted, don’t post this one, it is just for you. I’m starting a fermentation biz in Santa Barbara and you’ve given the brilliant idea of fermenting horseradish and jalapeno first. I was already onto doing garlic and lemon, but was missing the heat! I’m totally focused on recipes this weekend. I printed a bunch of your recipes and want to share with you a bit of what I’ve learned. I play with lemongrass, lemon basil and lemon zest a lot. I also like apples in a few krauts, and even curtido which isn’t authentic but a nice sweetness to the heat. Lastly fennel bulb go into my personal ferments….sliced thin. I did an experiment with 12 different fresh herbs. Just one flavor with cabbage/salt. The losers were the oily ones. Lemon verbena, rosemary, and marjoram. Yuck. Sage, thyme, and lavender all had nice qualities. Cilantro, chives and parsley were very nice. Tarragon is touchy, not too much, but small amounts are very nice, too complicated to mix with much. Try fermenting Habanero and other fruity hot peppers by themselves ( no spices) . The sauce is amazing. I use T for Tablespoon and t for teaspoon. You wrote you hadn’t found too many ways to use this condiment, so I thought I share the traditional one in the area where I live. There are a few traditional ‘Sunday’ or ‘festive’ soups around here which are special only in that there are huge chunks of meats in it (with or without bones). It can be a whole chicken or the tail of a cow, etc. but they are never suitable to eat with the spoon you eat the soup with. So first we eat the veggies with the liquid and some (usually angel-hair) pasta, then we eat the meat chunks with our hands. At this point we use the horseradish creme as a condiment for the cooked meat. Give it a try if you eat meat and let me know what you think. thank you so much for such a brilliant post! As a starter, could I use the Sauerkraut juice instead? The horseradish does indeed have good heat when done this way. On a side note, I find it also dissolves easily into soy sauce for making a wasabi-like dip for eating sushi. I have a question. I just made the horseradish, but I didn’t put the 1 1/2 cups of water into the horseradish. I did put the 1/2 cup of water with the salt on top of the tapered down horseradish mixed with salt and sugar. Was it necessary to add the water to the horseradish? 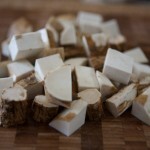 Adding water is mostly about getting the horseradish to a good and effective consistency. You can make your own judgment really on the amount of water necessary. Love this recipe. Will definitely try it. Many years ago I bought a Harsch crock and it came with a recipe for Russian sauerkraut, which remains my very favorite kraut. It has many veggies (like turnips, onions, carrots) and many spices (juniper berries, oh my), and herbs, but it also calls for slicing horseradish and layering it on top, just under the Cabbage follower leaves. 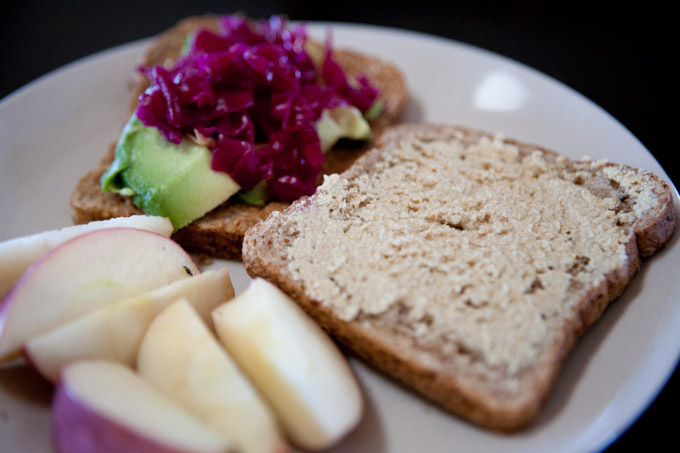 After 5-6 weeks, the horseradish slices are so mellow you can eat them straight or put on sandwiches. Got impatient once and only waited 4 weeks. Big mistake. This is one kraut that just continues to get better as it ages. The Harsch is currently full of this as I speak. Should be ready around the middle of November. Cannot wait. The Cabbage follower leaves never mold in the Harsch, so I use them to make yummy wraps. I love that idea of layering horseradish near the top. Thanks for sharing that. Thanks for sharing this recipe! I have tons of horseradish in my garden, you can easily multiply it by dividing the roots and putting them back at another corner of your garden. My idea is to make some wasabi looking paste for sushi. 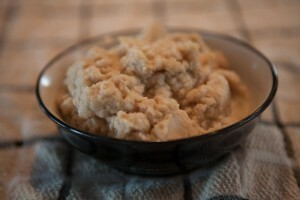 I was wondering, if you could also ferment the diced horseradish first and then blend to a paste. I thought the diced version might keep more spicyness, than blending it right away, as it has less surface for oxidation. Any ideas or experience on the difference on that?! To make it green, I will put some spirulina powder at the end.